Decoherence is one of the most important obstacles that must be overcome in quantum information processing. It depends on the qubit-environment coupling strength, but also on the spectral composition of the noise generated by the environment. If the spectral density is known, fighting the effect of decoherence can be made more effective. Applying sequences of inversion pulses to the qubit system, we developed a method for dynamical decoupling noise spectroscopy. We generate effective filter functions that probe the environmental spectral density without requiring assumptions about its shape. Comparing different pulse sequences, we recover the complete spectral density function and distinguish different contributions to the overall decoherence. via Phys. Rev. Lett. 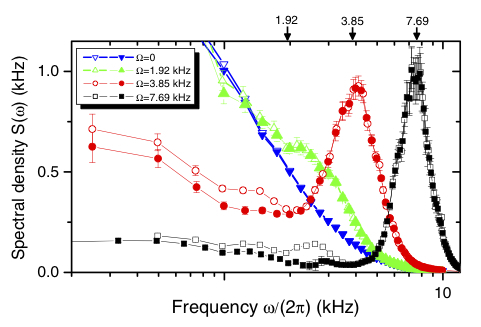 107, 230501 (2011): Measuring the Spectrum of Colored Noise by Dynamical Decoupling. Experimentally determined noise spectral density for a modulated system-environment interaction. The empty symbols were obtained when only the first harmonic was considered, the full symbols show the results from the exact method.